KO-C Concert Ukulele Crafted with Eastern mahogany and geared tuning machines for dependable performance. The Kohala KO-C Kine'O Concert Ukulele is a perfect instrument for carrying with you in all your adventures. Its compact size and dependable performance mean it's very easy to carry and won't let you down when you're in the middle of a beach party or jam. Crafted with Eastern mahogany and geared tuning machines this concert ukulele has the power to crack a smile on any face it encounters. 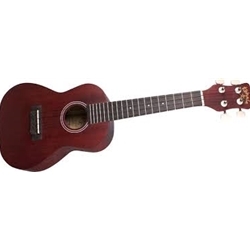 A concert ukulele is slightly larger than a soprano with a fuller sound, perfect for backyard parties or small gigs.